Every once in a while you run into a paradigm shift that radically changes the way you think about a subject. The Practice of Natural Movement is one of these paradigm shifts. 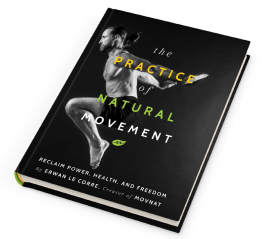 Simply put, Erwan Le Corre’s The Practice of Natural Movement is among one of the most important movement related books written within the past 100 years. It redefines movement in such a way that it will reshape how you look at the context of movement for our species; where does movement come from, what purpose does it serve, how can we best train to improve, and what principles do we need to apply within practice? This is a long review. So, if you don’t want to read the whole thing, the short version is that you need to own this book. For those who want more details, please read on. This book is beyond the ebb and flow of most movement books I’ve read. It is larger in scope and grander in practical use. 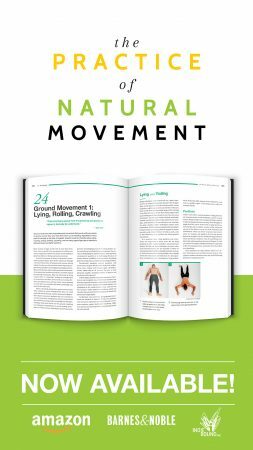 To cover the full scope of what The Practice of Natural Movement book has to offer, I have split the review into three main sections. First, I’ll provide my thoughts on the theory part of the book, which is really the first half of the book. Then I’ll review the practical back-half of the book that describes how to improve your movement; and the techniques to practice. Finally, I’ll close with why I believe this is one of the most important books written on movement, and why if you have not purchased it yet, you need to. To give some context as to where my thoughts and opinions are coming from, I’ll give a brief background on myself. I am a Doctor of Physical Therapy that works in a hospital with patients across the movement spectrum. I have read numerous books on movement, including dense research-laden textbooks, books on movement fads and new exercise programs, and more thought-provoking pieces that reexamine our relationship to movement, in general. One of my most prized possessions is the text book Movement Impairment Syndromes signed by the author Dr. Shirley Sahrmann. It’s fair to say that I am a movement nerd. From Feldenkrais to Yoga, Pilates to strength training, I am familiar with most movement ideas and currently popular practices. Full disclaimer, I have not been paid to write this review, nor have I received anything in exchange for this review. I was sent an advanced PDF copy of the book to look through by one of the members of the MovNat team, but I purchased my hard copy from a local book shop (I like to support the local shop). I have gone through both the Elements course and the Level 1 Certification and was already a fan of MovNat prior to reading this book. However, I would not be so excited to sing the praises of this book if it was not up to the highest quality; and Erwan has not disappointed. The first half of The Practice of Natural Movement is a thorough explanation of the philosophical framework of the MovNat method and why it exists. 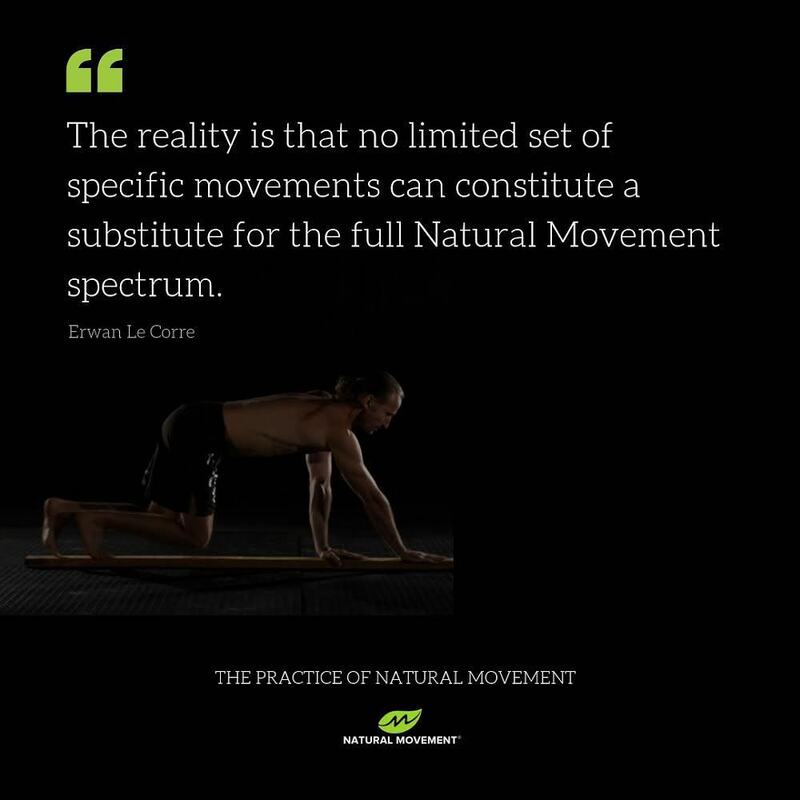 First, Erwan lays out the definition of Natural Movement. Although this sounds like a simple term, it takes nearly the full first half of the book before you can really grasp the full depth of what Natural Movement entails. Since Natural Movement is not a culturally accepted term, I believe this extensive explanation is needed and one of the real treasures of Erwan’s work, in general. Some reviewers have said this long section is “boring” or “light-philosophy”, but I really think they are missing the meat contained within this beginning section. Without knowing the context of how and why we should train naturally you are just looking for new “exercises”. Adding a few new “exercise techniques” is not what this book is about (although, the book is loaded with techniques in the second half). If you’re looking for the new fad-technique du-jour, this isn’t the book for you. This is about changing your perspective about movement as-a-whole. The philosophy informs how you train and the training helps you to see the importance of having a well thought-out philosophy and approach. 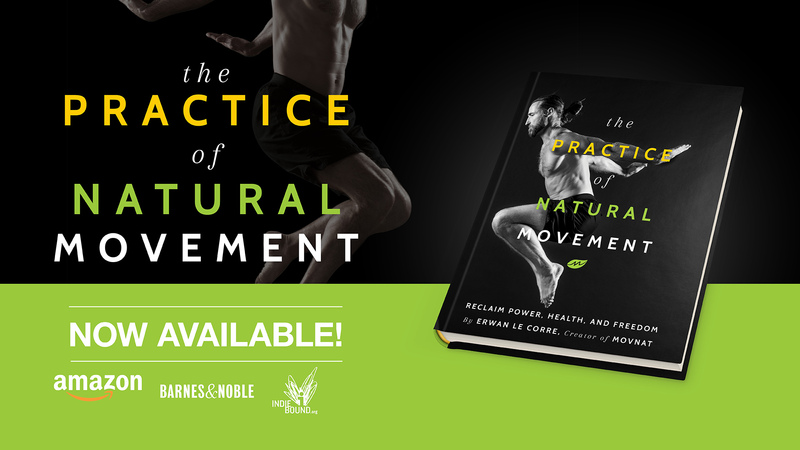 The book delves into 12 core principles and has a chapter focusing on each principle and why it matters to the context of natural movement. There is nothing light or fluffy about this section. I found myself astounded by the wisdom crammed into every single paragraph. I was constantly gaining a new perspective on how I view movement and how I can use Natural Movement to help myself and my patients. If the book had merely included this section, it would still have been worth every penny. There are several chapters devoted to how to improve your training, including concrete ways to improve efficiency of your techniques. I have not seen a more concise and clear explanation of how to improve movement efficiency in any therapy textbook I have ever read. This will enable you to improve your Natural Movement performance by self-guided feedback. You’ll learn how to teach yourself to improve. Learning from a qualified teacher during a course or in a training session is extremely helpful, but not everyone has the time, money of inclination to do so. And so, having the details on technique development and refinement within the book make it an excellent resource for anyone who is already familiar with Natural Movement – and of course, especially for newcomers as well. The entire back half of the book is dedicated to Natural Movement techniques and drills. This is where the rubber hits the road. There is a lot in there. If you skim through, there aren’t a ton of movements that jump off the page as “unusual” or “new”. A lot of it looks vaguely familiar, and that, of course, is the point. Although, to be sure, there are many natural movement techniques that we simply no longer practice in our modern society and may look unfamiliar and even intimidating at first. Natural Movement belongs to all of us and so most Natural Movements will look like things you may have seen before. This does not diminish the importance of this section of the book. Quite the contrary! A detailed and thorough explanation of how to perform these overlooked and underperformed movements in the most efficient way possible is useful for anyone interested in learning how to move naturally. From sitting positions, to getting up and down from the ground, to crawling, jumping and climbing there are details and pictures to help guide you through each technique. I am calling them techniques for a reason; anyone can perform movements instinctively, and without efficiency and ease, but Erwan has taken each movement and turned it into a specific technique that can practiced and refined. In today’s modern world, most people have not performed these movements in years, if at all. So, jumping into natural movement randomly won’t be safe, fun, or effective. Therefore, to relearn many of these natural movements, you need a system – hence the MovNat method. Systematization and a clear path to improvement is what you need to regain control over movement patterns that many of us haven’t practiced in a long time. The techniques presented in this book are appropriate for all levels of movers. If you are new to movement and exercising, in general, then the ground mobility is a great place to start; and if you can’t do these movements on the ground, then do them in your bed! For advanced movers and exercisers there are technique refinements that you’ve probably never thought of before. For example, the double arm swing during jumping feels strange at first, but its usefulness and purpose is seen quickly with actual practice. There are harder techniques and easier techniques. The reason for such a wide range is that Natural Movement is not only for high intensity activities; it includes the entire spectrum of human movement. If you are just looking to apply some techniques to your usual routine, you certainly have plenty to choose from. Try adding some of the ground movements and get-ups into your yoga routine, if that’s what you enjoy. Spice up your exercise routine with a slew of new climbing variations, instead of doing repetitive pull-ups. But again, the point of this book is not to scratch up a few “new techniques” and sprinkle them into your usual exercise routine. The point is to break you free of looking at exercise and fitness routines altogether, and instead see the entirety of natural human movement through the lens of the evolutionary necessity of our species interacting with our natural environment. Which brings me to my last critique of The Practice of Natural Movement. There really is no other book out there like it! No other movement teacher, educator, “guru” or researcher has put forward such a complete look into natural human movement. Some books talk about functional fitness, which is the buzz word currently in the fitness world, but it’s a vague term that doesn’t always relate back to real-world practicality. Some books present theories that over-simplify or over-complicate movement, but they mostly relate to modern fitness concepts. Nowhere have I seen such a concise, clear, and deep exploration on what movement means to us as a species. No one else is really doing this. In fact, this is the whole reason Mr. Le Corre wrote the book and came up with the MovNat method in the first place. Erwan, through his own personal experience, trial and error, and ingenuity has made it his mission to spread his refined and well thought-out system for regaining Natural Movement to anyone willing to read. Why do we move the way we do? What movement patterns would have made survival as a species possible? Why should we continue to train these movements in our modern world? Why do children across the world go through the same movements and why as adults do we sometimes lose them? Why do we need a method to reclaim these movements that most of us have stopped practicing? This book answers these questions and more that you probably haven’t even thought of. 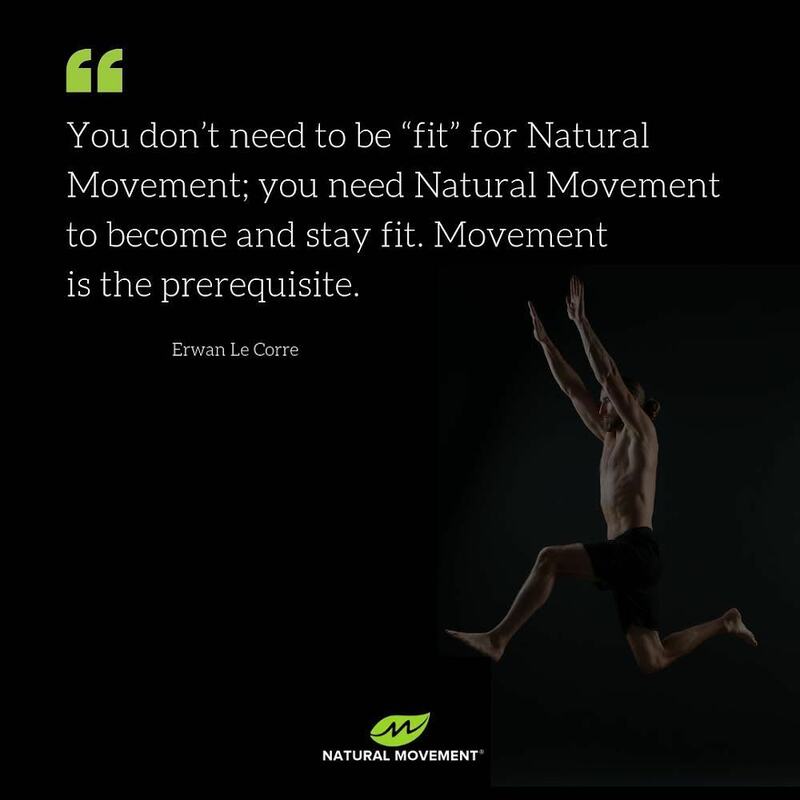 Natural Movement is universal to all of us, and yet, it isn’t known or practiced in our modern fitness world. I can’t explain succinctly how all-encompassing the paradigm shift is when switching from thinking of movement as exercise and fitness to movement as a natural imperative aligned with our evolutionary nature. It literally would take half of a book to do it justice. Guess what? Such a book exists now. So go read it and change the way you think about movement forever. Buy this book, read it and read it again. Every page is worth studying; there is no filler. After reading through it, you stop and look back and wonder why this information hasn’t been common knowledge before now. What happened to the general knowledge about natural human movements – movements that we all have the right to practice and explore? No matter how we lost this knowledge in our culture along the way, this is a reminder to come back to our true nature and relearn what was once every person’s birthright.